Hi everyone! Today I have a really exciting post to share- my Costa Rican experience! 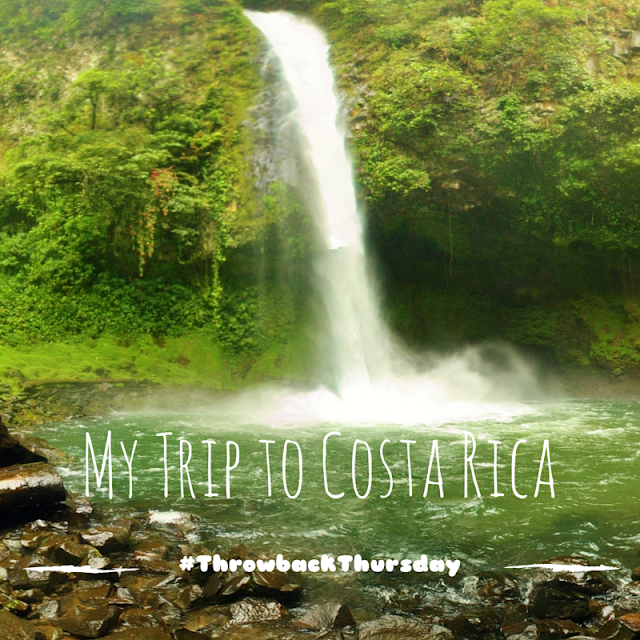 In March of 2013, Dan and I took a trip to La Fortuna, Costa Rica during his senior year spring break. I've been wanting to post about our amazing adventure for some time, and finally sat down to write about our trip. I hope you'll enjoy this #ThrowbackThursday / Thinking Out Loud post. Before we start, I want to mention that we actually bought this package from Groupon. I've recommended Groupon Getaways to all of my friends because Dan and I have had great experiences in the past. We also took a trip to Budapest and Prague from Groupon and haven't encountered any problems with either excursion. If you're looking to go on a trip soon and want to save some money, I highly recommend checking out Groupon first. We stayed at the Lomas del Volcan, which is located near the base of the Arenal Volcano. Each guest stays in a private hut, which was beautiful and spacious with comfortable beds, huge showers, and patios to view the incredible volcano. As you can see in the pictures, the volcano was partially covered by fog (which is apparently very common), but it was still amazing! The hotel had beautiful gardens all over with paths you could run or walk on. There was also a pool and hot tub, as well as restaurant with a free breakfast! Let me tell you- fresh Costa Rican coffee, plantains, fruit and juice is the best way to start a morning. Everyone who worked there was so nice and helpful. Any trips that we wanted to go on were scheduled at the front desk, and they always made sure our ride would be right on time. I would highly recommend staying here! The first activity that we did was horseback riding. I had such a great time! We got to explore the Costa Rican rainforest (our guide carried a machete and had to cut down plants and trees that were in our way..crazy!). The views along the way were gorgeous. We definitely got to enjoy the beautiful Costa Rican scenery in a fun and different way. P.S. If Susie is reading this post, please don't be offended by my riding position! This was only my second time on a horse, and we had to learn the "Costa Rican" riding style which was challenging! Ziplining was definitely a highlight of the trip for me! The guys who worked there were really friendly and funny. They loved the fact that I could speak Spanish and taught us some fun tricks we could do on the ropes (I'm doing pollo loco above, and also went upside down!). They also made us feel really safe and made sure we felt comfortable the entire time. After ziplining, we got to explore the hotel's beautiful gardens and pools. There was even a huge pool with a swim up bar and slide. We had a great time exploring this gorgeous hotel, which was on the other side of the volcano from where we stayed. The hotel also had a few animal enclosures including butterflies and gators! Everywhere we looked, we saw new plants, flowers and animals. It truly felt like we were in a different world! I could not get over the natural beauty of Costa Rica. Dan and I are actually planning on getting married in Central America next year, partially inspired by the beauty of this trip! We had one off day from scheduled activities, and explored the town. We also hiked up to the Catarata de Fortuna which was gorgeous! One thing to keep in mind in this area is that weather changes very quickly. It took us about two hours to walk there, and it was constantly changing between a downpour and hot andsunny. It was interesting to say the least, but I highly recommend always having a rain coat nearby! We spent a lot of time at the waterfall, which is in a large park. There were a few different spots to swim and a few smaller falls. It was a bit of a challenging hike but well worth the walk. Look how gorgeous it is! Our final day was full of lots of adventures, including white water rafting! We had a great time with our amazing guide, Carlos. He was a lot of fun but also made sure we were all safe. We stopped along the way for a fruit picnic and got to see lots of animals- monkeys, sloths, "blue jean" frogs, and more! After so much excitement, our entire group made our way to a private residence for some traditional Costa Rican food. The place was gorgeous and highlighted how important agriculture and being green is to the locals. All the food we ate came from the mansion's farm and gardens, and old fruit was used as bird feeders outside. There were so many gorgeous birds flying through the house and around their amazing garden during our dinner. Our food was delicious, and it ended with the best coffee ever. It was made using a really old technique similar to French press coffee, and made the high-quality Costa Rican beans really stand out. We also got to see a demonstration on how sugar is made from sugar cane. It was really interesting, and Dan and I got to meet the animals after their hard work! This entire trip was a dream come true. Costa Rica is such a gorgeous place, and luckily the government and citizens are working on preserving that beauty. In fact, they are aiming to be fully carbon neutral by 2021 and use hydroelectric power, wind farms and geothermal energy for over 94% of their energy. It was so inspiring to be in a country where the residents saw Earth as a precious resource. The people that we met were also incredibly friendly and welcoming. 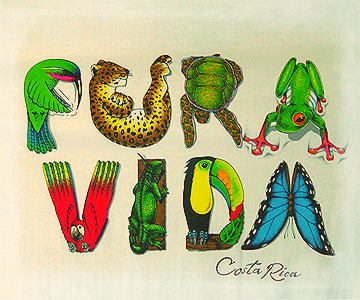 The motto in Costa Rica is "Pura Vida", and everyone greeted us and left us with this phrase! It literally means "pure life" but has a deeper meaning of enjoying your life and realizing how good you have it. I loved the phrase and still use it! If I were to get another tattoo it would definitely be a Pura Vida one! I love all of your pics! This looks like such an amazing vacation. I actually went to Costa Rica when I was 16 with my high school Spanish class and it was so much fun. I would love to go there again with my husband and daughter. Thank you! That's so cool that you got to go. I wish my high school did things like that! That looks like such an amazing time! I've never been to Costa Rica, but I've heard so many good things from anyone I know who's visited, and I'd love to go myself one day. My mom went to Costa Rica when I was in college and came back with amazing stories. Her favorite was the fresh fruit for breakfast every day. What a cool trip! I've never been there, no but I think I'd go just for that cup of coffee. It would be incredible! Hawaii is my favourite place on earth although I've always wanted to go to India. Maybe someday! The coffee was seriously out of this world! I would love to visit Hawaii some day..looks gorgeous! Looks amazing!! I'm so jealous. My wanderlust has me itching to travel! Awesome pictures. I've never been to Costa Rice. My favorite vacation was Atlantis way back in HS. I would die to get to Dubai but lately I've been looking into heading to Peru to hike Machu Picchu! Loved this, Gretchen! Costa Rica has long been on my list of places to visit. A few years back I planned a vacation there with a great itinerary. Unfortunately my husband refused to go because he didn't want to deal with all the bugs. :( I asked a friend of mine who had been there & gave itinerary suggestions about it and she didn't think it was too bad but you did have to use mosquito nets and things like that. Even that was too much for my husband, so we'll probably never go there. Maybe I would on a girls' trip though! And thanks for the tip on Groupon Getaways! I honestly didn't have any problems with bugs at all! We brought lots of bug spray and I never even used it. It might depend on where you stay, although we were in the rainforest area which is supposed to have lots of bugs. Maybe we just got lucky? If you ever want to go I would totally go with you!! I headed to Costa Rica in HS with a group of science class kids during the summer. Wonderful country. And that coffee. I tell ya what. SO GOOD. We stayed at hotel on a miniature island you could only get to via river/boat. It was so unique. I wish I could remember the name offhand. Glad to hear good things about Groupon Getaways. The BF & I are headed on one in February to New Zealand. I want to buy them all, but some just don't work out. Italy is high on my list, specifically Venice, and Groupon seems like the way to go with that trip too! That sounds like such a cool experience! And I hope your trip is great. Is it through Gate 1? We also went on a trip with them (bought through Groupon) and it was fantastic- great company. Hope everything is smooth for you! I always love your travelogues. That was a fantastic trip. I am so happy that Dan is opening up his eyes to the world. We seriously got so close to all the animal! The locals had no fear and would wouldn't mind the animals running around. They even picked up the blue jean (poisonous) frog because they said he liked their warm skin. It's amazing how natural they are! It was amazing! The package we got was actually called the "Adventure Seeker" package. They had a few more but I knew this one was perfect. I hope you get to visit! Wow, what an amazing trip. Costa Rica has been on my bucketlist for quite some time(mainly because they have a huge sloth sanctuary!) and your photos are stunning. Love the rafting pic- looks intense! That would be really cool to see! We got to see a few sloths hanging out in trees...so neat! Wow beautiful pictures! I would love to go there sometime! Costa Rica looks so incredible, and it's really amazing how eco-friendly they are! They're definitely high up on my list of places to visit! Lovely post! Your trip sounds like it was amazing! Beautiful pictures!